A couple of readers sent me questions about brightening serums and other anti-oxidants, including a follow up on a really really old review of Caudalie Vinoperfect Radiance Serum. Someone else asked if I've tried or going to try the newest Caudalie serum, Polyphenol C15 Anti-Wrinkle Defense Serum. So I guess it's a good time to talk about non AHA/non retinoid serums and what they can do for us. I can't remember if I ever repurchased the older Caudalie serum, but my guess is that I hadn't. It was nice, but not impressive. While I haven't stopped using radiance products and always have a vitamin c serum in my rotation, I'm going to skip Cudalie Polyphenol C15 a pass. A quick glance at the ingredient list reveals that fragrance is much higher there than hyaluronic acid (it's the ninth ingredient out of twenty, which makes me question their priorities). Back to vitamin C. It's not just the stuff your mother had you take at the start of flu season. When it comes to skincare, vitamin C is a heavy duty antioxidant and anti-inflammatory ingredient that helps skin repair and protect itself, produce more collagen, and reverse discoloration, resulting in a brighter complexion. It's also a volatile material, so packaging is important to avoid over exposure to light and air, hence the pumps and droppers (and the importance of not buying in bulk/hoarding backups). Right now I have two vitamin C serums in regular use: Jason Natural C Effects Pure Natural Hyper-C Serum (originally a press sample, repurchased since) and Paula's Choice RESIST C15 Super Booster, which is a new(ish) product that I've been using for the past three weeks. Ingredients: Water (Aqua), Glycerin, Sorbitol, Calcium Ascorbate, Polysorbate 20, Biosaccharide Gum 1, Scleroglucan, Aloe Barbadensis Leaf Juice (organic), Camellia Sinensis Leaf Extract (organic), Carthamus Tinctorius (Safflower) Oleosomes, Citrus Aurantium Dulcis (Orange) Fruit Extract (organic), Myrtus Communis Leaf Extract (organic), Opuntia Coccinellifera, Ascorbic Acid, Citric Acid, Maltodextrin, Sodium Hyaluronate Thioctic Acid, Tocopheryl Acetate, Xanthan Gum, Alcohol (organic), Benzyl Alcohol, Ethylhexyl Glycerin, Gluconolactone, Potassium Sorbate, Sodium Benzoate, Benzyl Benzoate, Benzyl Salicylate, Butylphenyl Methlypropronial, Coumarin, Limonene, Linalool, Fragrance. 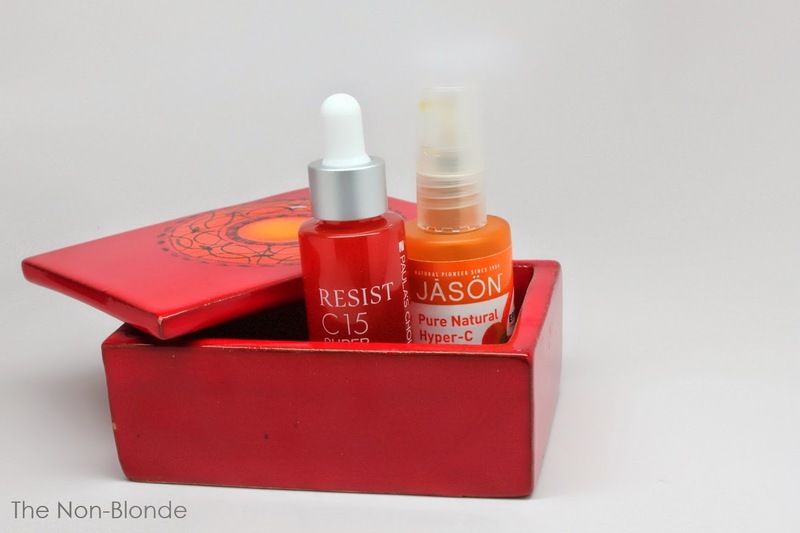 Like all Paula's Choice products, her Resist C15 Super Booster means business. You can add a few drops to other skincare products (hence the "booster" thing) or use under your moisturizer. It's incredibly high in vitamin C (15%, the second ingredient on the list) and is formulated to help skin heal and repair-- it's full of non-nonsense stuff and doesn't contain anything questionable, as far as my googling skills can find. The one drawback is the smell. There's no added fragrance so nothing to mask the slightly charred and somewhat metallic smell (I have to wash my hands well after application, because this stuff clings forever). Since I also use other active skin care products I doubt I'll ever be able to tell which one is more brightening than the others, but I can say that after three weeks I do see an improvement in skin texture exactly where I needed it (what's left of the great coconut disaster of 2014). $45 from paulaschoice.com. I'm on my 4th go-round of the Paula's Choice RESIST C15. I use it in the morning with another PC serum, and in the evening with moisturizer after whatever AHA or BHA I've used has some time to soak in. I've really noticed a difference since I started using it. I'm on my third bottle of Paula's Choice RESIST C15 Super Booster - it's a great product and very reasonably priced, and just the thing to clear up sun damage/discoloration from my FL days. The only thing that is quite "bad" from PC Resist C15 is the shelf-life. Three months after bottle opening. I wish the packaging is more air and light-tight so it can stays a bit longer (like Skinceuticals CE Ferulic, the new version with pump bottle). - We never know what is in perfume. Considering the brand, it most likely includes essential oils and vegetal extracts. Some essential oils have a proven antioxidant activity. Perfume composition are not duplicated for other brands. Just because it says perfume doesn't mean it only adds scent. - Hyaluronic acid is a good moisturizer. It plumps the skin and hydrates well in the hours following application. For long term moisture, other ingredients have proven more effective. It can depend on the type of hyaluronic acid, but it is difficult to use more than 1% because it will prill. Usually companies use much less and just dilute a 1% base solution. So when you see 50% hyaluronic acid, the actual concentration is most likely 0.5%. - Both hyaluronic acid and perfume are most likely below 1%. Following INCI rules, you can put ingredients below 1% in whatever order you like. In this case, perfume being before hyaluronic acid probably doesn't mean anything.